Last week's post was on Firsts. 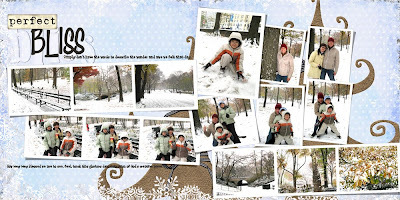 Our first experience with snow was so exciting, we took nearly 100 photos, during that one day, and in fact that two hours or so we spent at Central Park. lol. See how I filled 3 more layouts with them below. My friend Kate wrote me and said "It's always magical!" I love that! I hope Ryan remember the joy of his first ride, every time he rides. And so far I see Jared still excitedly openning his Lego Mindstorm box the moment he gets home from school. And I still get very happy every time I think I nailed it on a layout! May we all enjoy our joys as if they were the first time! For me, this verse from John 10:10 has been so true for me: Jesus said, ..." I have come that they may have life, and have it abundantly." and John 7: 37,38 ..." iIf anyone is thirsty, let him come to me and drink. Whoever believes in me, as the Scripture has said, streams of living water will flow from within him." Whatever it means to you, take Tink's advice, live! Credits: Credits: Background paper, ribbon, jewelled snow flake, snowborder, all from Miss Mint’s Winter Snowflake kit, the tinier snow flakes are by Pam Lefors’ winter in july kit. 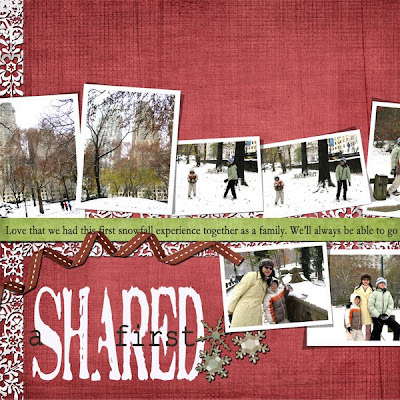 Credits: Background paper from Bluesies by Shawna Clingerman, paper trees by Nathy Geuens, snowflake border from Miss Mint’s Winter snowflake, ‘perfect’ word by Chantal. Thank you! 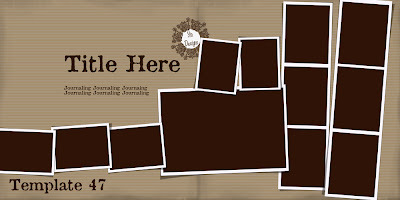 Your blog post will be advertised on the DigiFree Digital Scrapbooking Freebie search engine today (look for timestamp: 15 Jul [LA 02:55am, NY 04:55am, UK 09:55am, OZ 07:55pm]). Thanks for continuing to share your templates and life! I love all your layouts and can't wait to start my vacation pages. I'll be using your templates for sure! I really enjoyed the Mother Teresa quote and have put it on my blog so that I may be reminded!! Thanks again. As always, your layouts are beautiful and thank you for the free template! Love it! Your templates are great because I can squeeze so many pictures on a page. Thank you!! Love your newest layouts, fabulous as always. Thank you for the template. Once again, so amazing and inspiring. Thank you so much. Thanks for the wonderful template and for sharing your fantastic layouts with us! 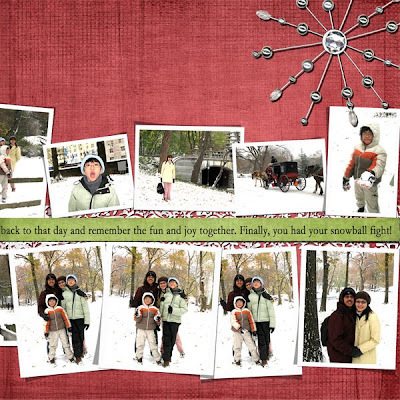 Glad you enjoyed Central Park and the snow so much! I also was inspired by that Mother Teresa quote. I will send it to my son in a letter as he has just started his first year at the US Naval Academy in Annapolis and he could use some inspiration. Your layouts are beautiful as always. Thank you for another great template too! 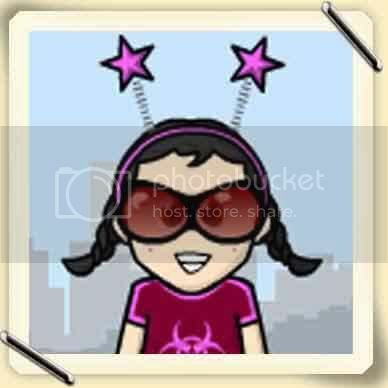 I'm discovering your blog, and I'm loving it ! Thank you for sharing with us these superb double pages ! And thank you for the template. Yin, thank you so much for sharing your template. Thank you, too, for posting the scripture. Such a powerful verse. Jesus is in us! I was losing hope-I was thirsty but didn't realize it until I found Jesus. What a difference he has made in my life. Thank you so much for everything you put on your blog. And thank you for sharing the template. Thank you for your post about living life - it's something I need to be reminded of often. 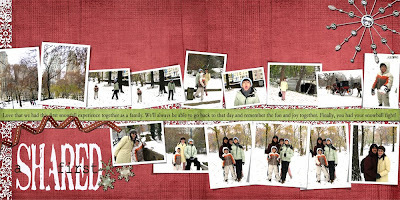 Thank you also for the templates - I love that they have so many photos in them!!! Thanks for sharing. I love your templates. You do a fabulous job making them! I'm blushing from the mention, but I like how you expounded on it. 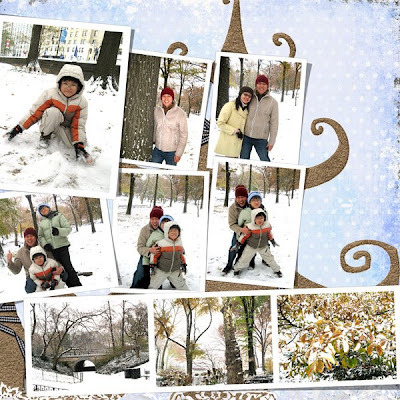 :) Your snow photos are so wonderful. I would love to be able to see snow again if just for a little while. Thanks for the template. Thank you for your template ! Hi Sylvie, yes I will keep the templates I share for free and the ones I sell in the store separate. So the ones I sell in the store will not be given as freebies, thanks for asking! I just found your blog recently and your template store, and I love your work. Your layouts are fabulous, and I love how you incorporate so many photos into each; something that I've been working on trying to do more :) Thank you for the great free templates and for making the others available in your store; I went and purchased all of them this past weekend to use on our cruise album, because I have oodles of pictures! Absolutely adore this multi-photo template + the Mother Teresa quote! Thank you! I love your snow LO! Thank you for sharing you templates. You are so generous!